We have been to Woodstock Vermont many, many times as it is one of our favorite New England places to visit. We spent 5 nights in Woodstock on this trip whioch gave us sufficient time to revisit our favorite restaurants as well as explore new ones. Each time we visit Woodstock, we make sure we have a reservation at The Prince and Pauper. This cozy, family restaurant offers a number of nice dishes. We were very pleased with four of our five dishes. Tom was especially pleased with his baby spinach and arugula salad with beets, goat cheese, candied pecans and light sherry vinaigrette. Joyce’s house salad was fine, although boring by comparison. 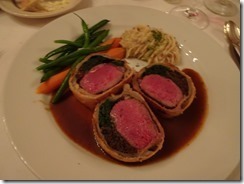 Tom was similarly pleased with his other two dishes: roasted duck breast with corn cake and cole slaw (especially after removing the BBQ sauce which masked the delicate flavor of the duck), followed by boneless rack of lamb prepared Wellington style (wrapped in spinach, duxelles and puff pastry with bordelaise sauce). Joyce’s Maine crabcake entrée—with watery, frozen crab–was the only disappointment. Our wine, a 2015 Willamette Valley pinot from Domaine Drouhin. Our local friends suggested trying Mangalista. Are we glad we did. We began with a delicious roasted carrot dish served on a bed of carrot hummus with figs, and pomegranate seeds and toasted quinoa for texture. We then enjoyed butter-poached lobster with autumn squash, coconut, hearts of palm, jalapeno jam, red onion, pumpkin seeds and golden trout roe. Our friends enjoyed their interesting preparations of swordfish and bavette steak. The server recommended a Mosel Riesling (2016 Selback Incline Riesling to be precise) to complement the lobster and the swordfish. Our only disappointment came from a dessert that sounded very interesting, but which none of us found especially enticing: Homemade maple ice cream topped with caramel, pig fat, chicharrons and peanuts. Simon Pearce has a scenically-situated (over a small waterfall and a covered bridge) glass-blowing studio and store in Quechee Vermont that is ideal for lunch. Scoring a window table overlooking the scene (which we did) makes it even more pleasant. We began with a pleasant small flatbread appetizer that was loaded with hen-of-the-woods mushrooms and roasted heirloom cherry tomatoes and topped with balsamic drizzle. Our entrees were very good: grilled swordfish with pearl couscous, pickled fennel and pomegranate vinaigrette, and seared Scottish salmon with sweet potato and cranberry hash, goat cheese and a maple-mustard cream sauce that was lovely with the salmon. While we normally go here for lunch, we ended up going back for dinner one night. Dinner provides a broader menu, a large and well-planned wine list and somewhat more complex preparations, the darkness hides most of the view. We began with Vermont cheddar soup which was fine, after we returned the bowl to be reheated. Then then had two entrees. The horseradish-crusted Atlantic cod was served on a bed of mashed potatoes and covered with a stack of crispy leeks. Its balsamic-shallot reduction, did little to enhance the dish’s taste. The seared Faroe Islands salmon was more interesting, with cauliflower, spinach and chevre gratin and a very nice brown butter puree with aged balsamic, which nicely complemented the fish. We chose one of our Willamette Valley favorite wines, a 2013 Shea Vineyard pinot from Raptor Ridge. While the salmon did redeem the other dishes, we had expected more from dinner and will stick to going here only for lunch. As this restaurant is right next to Simon Pearce in Queeche, we have seen many times, but never tried it before. We were glad we tried it this trip. Our escargot starter was OK, but not great. The dish had a minimal amount of garlic/parsley butter, topped with toasted panko. Our two, large entrees were much better. Tom had a crisped, pan-seared, one-half duck with blueberry-cardamom sauce on a bed of leek-garlic risotto. Joyce had a delicious shrimp and lobster risotto with saffron alborino rice and shaved asparagus. We don’t know what took us so many years to try this restaurant, but we will return. Our local friends recommended that we try Chef Brad’s Crazy Side Food Truck. You order from a truck in the parking lot, but then can either eat outside or go into a cute small building with inside seating. While the concept was appealing, the food was less than exciting. The lamb burger was dry, although the tzatziki sauce did help it. The mahi-mahi sandwich (with a tasty soy-mayo sauce) had such as thin slice of fish that we had to fold it in half to taste it inside the thick bun and with the lettuce, tomatoes and red onion. On the positive side, the French fries were nice and crisp and the onion rings were thick, juicy and nice and lightly fried. And, while Brad’s did offer fruit juices and sodas, people were free to bring their own beverages into the house. We brought in some of freshly-bought apple cider and another table had a bottle of wine. Bentleys has been a staple for us for evening drinks (and Friday evening entertainment) in Woodstock, but seldom for food. However, this time we had a very good lunch that consisted of a grilled chicken breast sandwich with melted cheddar, herb mayo and Applewood-smoked bacon, and a burger with maple-smoked cheddar, Applewood bacon and aioli on a brioche roll.